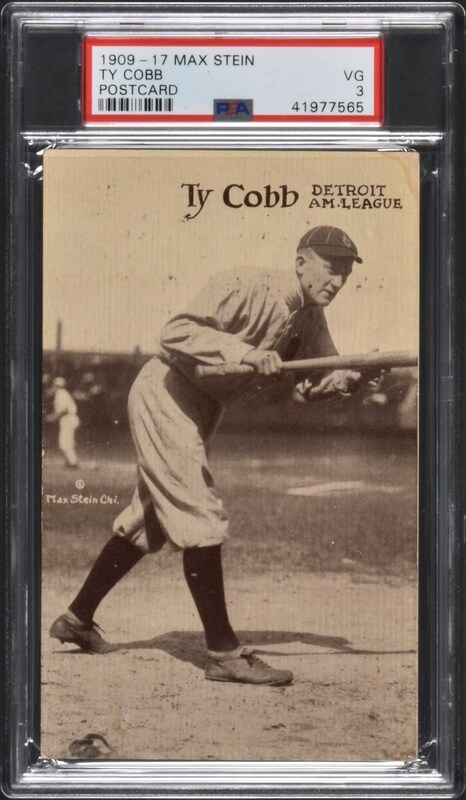 Lot # 142: 1909-1916 PC758 Max Stein Postcard Ty Cobb - Extremely Rare Advertising Back - Highest Graded! Graded VG 3 by PSA (submitted by REA). This is the ONLY example graded at this level with none higher! Outstanding sample card of Hall of Famer Ty Cobb (Detroit Tigers) from the rare and highly regarded PC758 Max Stein Postcards set issued from 1909 to 1916. 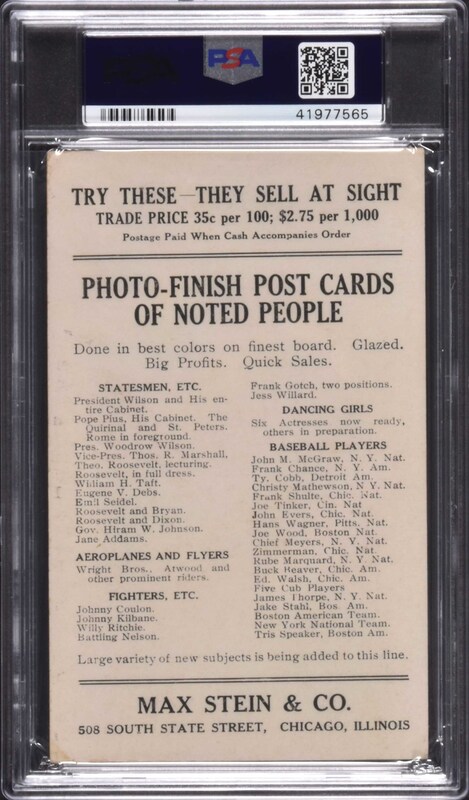 The offered example is especially noteworthy for its extremely rare and desirable advertising back, which features promotional text for the company's "Photo-Finish Post Cards Of Noted People," including a wide variety of baseball players, boxers, and statesmen. Baseball photographer Max Stein's classic postcards are among the most revered of all early twentieth-century postcards. Cobb is ideally depicted in a squared-around batting pose. The image on the card is bright and crisp, with light wear to the corners, and a faint stain in the upper right. The reverse is perfectly clean and boldly printed. Only seven examples of Cobb have ever been graded (at any level) by PSA and SGC. This is one of the key cards in the set and one of the great Cobb cards of the era. An ideal sample card featuring one of the game's most legendary stars, from one of the most substantial of all 1910-era baseball postcard issues. Dimensions: 3.5 x 5.5 inches. Reserve $1,000. Estimate $2,500+.